Garden Releaf Art. An awesome way to enjoy a garden. Garden Releaf is an innovative program to help people understand the benefits a garden has on your health and wellbeing. Sadly nearly 3 million Australian’s live with depression and anxiety. Garden Releaf Day is a chance for you to get involved by attending one of the independent garden centres around Australia who are participating on Sunday, March 24th 2019. By getting involved you can learn a bit more about the benefits a garden offers, and most importantly, help yourself and others improve both mental and physical wellbeing. It’s as simple as immersing yourself in a garden amongst plants. A garden is also known to reduce stress, anxiety and build confidence in all your family members. Read about mindfulness for kids CLICK HERE. Plants have incredible healing properties, in fact, research continues to identify ways that both plants and being in a garden can enrich our lives. Independent garden centres across Australia can choose to participate in the official Garden Releaf Day on March 24th. Check the list on their website for details CLICK HERE. What you’ll find on the day will be a range of ideas, opportunities, inspiration and events that will help everyone connect with a plant or garden. Simply by connecting with nature, you can enrich your family garden life. Our stress and anxiety release comes from plants, gardening and activities. 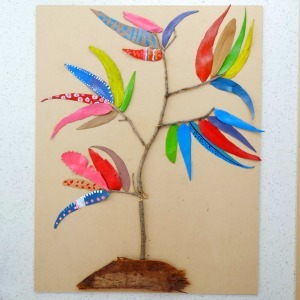 Creating these Garden Releaf artworks, was the perfect way to talk about how we feel, what makes us happy and the benefits our garden provides when we are in it. Why not try it this weekend. Head outside and see what you can find. I’m proud to be raising awareness for such a meaningful day. A garden can offer so much for your health & wellbeing. Check the website for independent garden centres around Australia who are taking part and supporting Beyond Blue and Garden Releaf Australia. 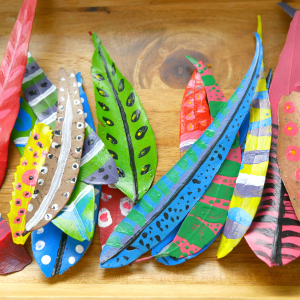 Start by painting your leaves in bright colours and let dry. Once the leaves are dry, add some designs to them and let dry. Now you’re ready to create your artwork. Once you have selected the branch for your tree, cut a piece of MDF sheet to fit the size of your branch. You may need to break some of the branches to make them flat on the board. Select and lay out your leaves. Glue your leaves down one by one and you might need a weight to rest on top while it sticks. Don’t forget to glue down your bark for the base of the tree to represent your dirt mound. You can always paint the board a white or light colour as well. 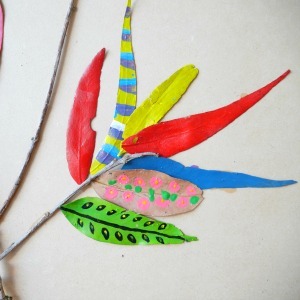 There are lots of fun ways you can create your Releaf Artwork. Get creative and have fun! Don’t forget to talk to your kids about how it makes them feel. Being outside and collecting their nature pieces and creating something fun. You might wonder why I’m so passionate about the benefits of gardening, and that’s a fair question to ask. My story began with my dad and is the reason behind my business. You see my dad has dementia.